A suicide bomb attack in the northern Lebanese city of Tripoli has killed at least seven people, in the latest violence linked to Syria's civil war. The Nusra Front, al-Qaeda's Syrian affiliate, said it was behind the attack, which also injured 30 people. The blast, on a cafe in a predominantly Alawite neighbourhood, was the first major attack in Lebanon for months. There has been tension in the past between Tripoli's Sunni Muslim majority population and its Alawite minority. 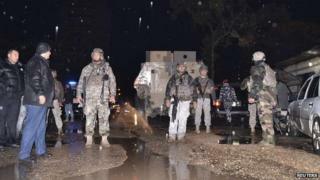 Lebanon's National News Agency said the attack was carried out by two men from Tripoli, where longstanding religious tensions have been exacerbated by the war in neighbouring Syria. In a statement, the Nusra Front said the attack was "in revenge for the Sunnis in Syria and Lebanon". The war in Syria has pitted the government of President Bashar al-Assad, an Alawite, against an insurgency dominated by Sunnis. Tripoli had been in the midst of a tense calm since last October when fighting broke out between Sunni militants and government troops, killing 11 soldiers, five civilians and about two dozen militants. Prime Minister Tammam Salam said the bombing was "a new attempt to spread the seeds of strife" in Tripoli but insisted that it would not "weaken the determination of the state to confront terrorism and terrorists". Lebanon's security has been severely damaged by the Syria crisis. It has also been worsened by its own paralysed government, with the country having been without a president since May last year. Is Islamic State heading for Lebanon?